Happy Thanksgiving to all the TopSpeed readers, we hope that your Turkey Day is off to a great start. We all know the importance of Thanksgiving here in the U.S., but this day is also a very special one for the automobile racing industry. On this day, 118 years ago — in 1895 for those that don’t have a calculator handy — America’s first ever automotive race, the Chicago Times-Herald Race, took place. It was a 54-mile journey from Jackson Park in Chicago to Evanston, IL and back, and it included just six cars at the starting line — two electric cars and three gasoline-powered cars. Only four of the cars actually finished, and the highest top speed during the race was a sluggish 7.5 mph. The winner, Frank Duryea, managed to complete the icy course in nine hours, netting a $5,000 prize in the process (about $140,000 by today’s dollar value), and the second-place finisher took another two hours to reach the start-finish marker, which was a boulder near the Museum of Science and Industry. This rock is now legendary in the automotive racing industry, as it marks the beginning of one of the biggest industries in America. Each and every year, a group of 100, or so, exotic cars and motorcycles make their way to "The Rock" on Thanksgiving day to celebrate the race (weather permitting). And this year is no different. The celebration typically kicks off around 9 a.m. So, if you have some extra time between cooking and stuffing your face with Turkey, you should swing by and check out some of the cars and see the most famous rock in racing history! For those that don’t know, "The Rock" is southwest of the Museum of Science and Industry. Simply take the Museum exit on Lake Shore Drive in Chicago and look for the line cars; you can’t miss it. 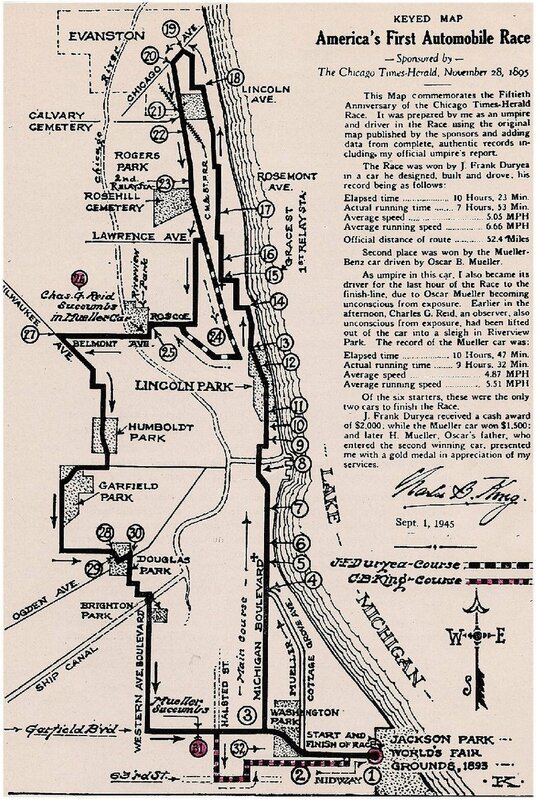 Check out a map of the original race after the jump.